Turning to the right side of the desk a single quarter sawn oak board rounded on the outside edge supports the desk. 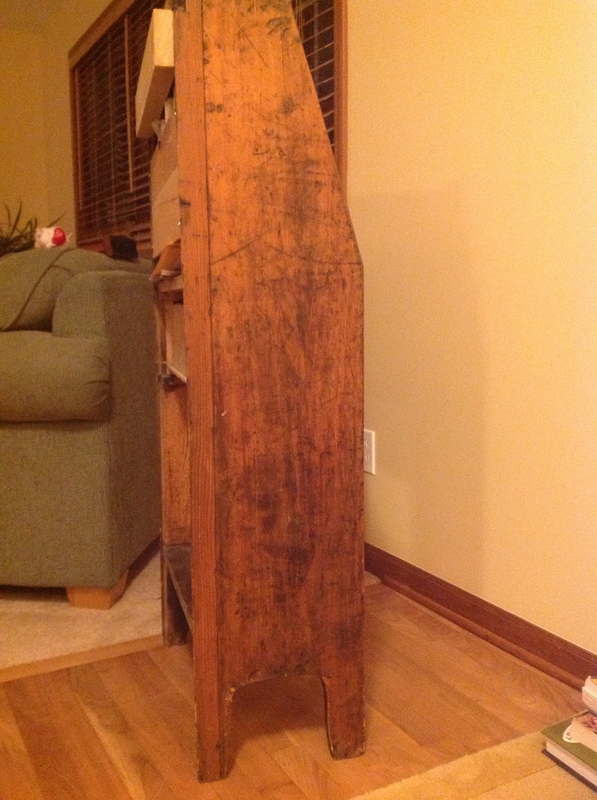 The left side, however is of an entirely different species consisting of two boards stained in an attempt to match. Comparing the two pictures it is very difficult to see the difference. If you click on the picture on the right it will enlarge and you can see that the wood is clearly not quarter sawn oak and does not match the left side. Turning the desk around immediately reveals that the back is missing. 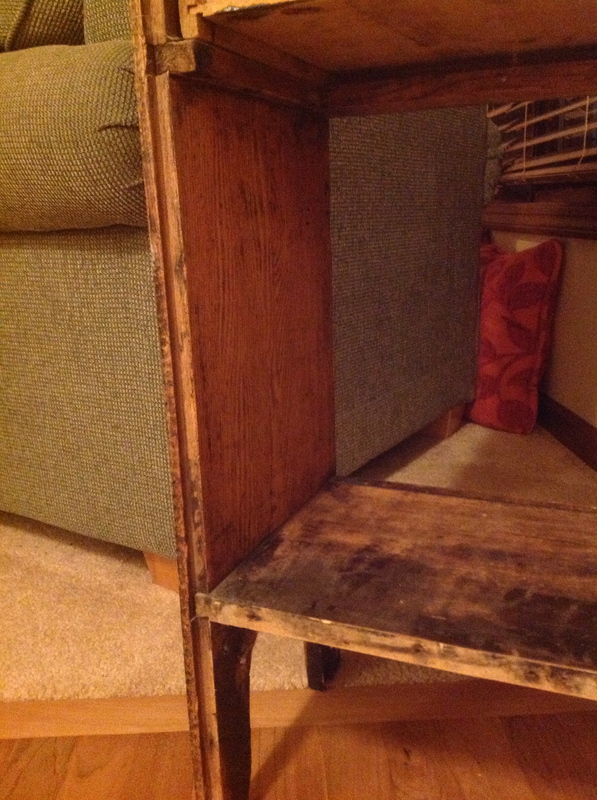 A piece of plywood is crudely screwed to the back of the cubby holes to prevent papers from falling out. There is clear evidence that there was a back attached at one time. A rabbit runs down the right side and there are nail holes in the shelves. 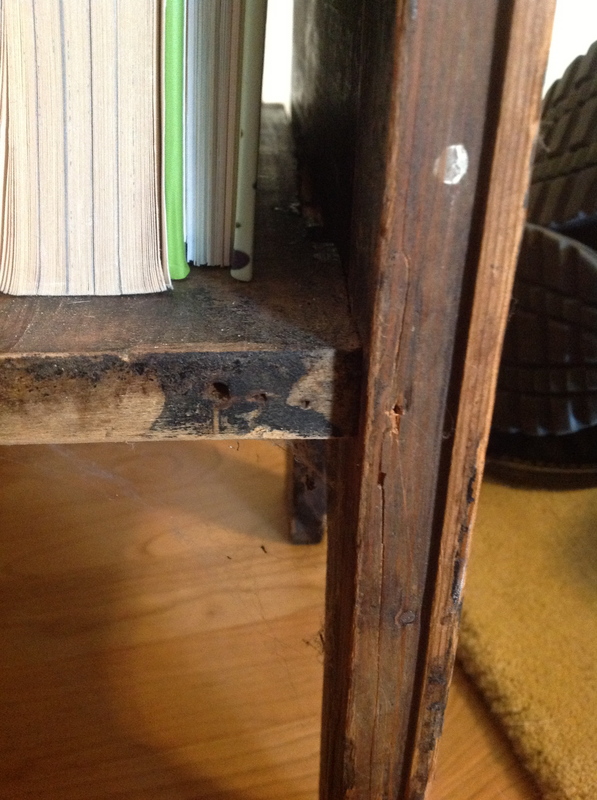 The left side is again different: A rabbit has been cut along the left side of the desk, however the drawer slides and shelf are not dovetailed into the side, instead they are attached with nails. Images can be enlarged if you click on them. In summary we have a simple quarter sawn oak writing desk that is rather appealing. It has simple clean lines, works great but has a few adaptations. A lock that is covered with a handle, an entire side that is replaced with a different species of wood, changes to the attachment of the shelves that is clearly done by a different woodworker. A missing back and evidence that this piece was painted black at one time and then restored. A few phone calls and there are a couple of different possibilities. 1. My wife’s great grandfather earned his living moving from farm to farm threshing grain. In payment for threshing, items were often taken in trade: furniture, food, tools were all exchanged. Could this desk have been made and bartered. 2. My wife’s grandfather would trade food from his garden to workers at the local steel mill in exchange for items he could not make himself. A 50# bag of potatoes brought home many useful items. 3. Like many people growing up in the 30’s and 40’s, other peoples discarded items could be rebuilt and repurposed. Discovered in scrap yards and dumps entire homes could be furnished with quality items. Many of us continue to rebuild wonderful items from the past. Scanning the internet my wife found a picture of a similar desk attached to shelves. Could this desk have been part of a larger unit? Spend some time looking around your family’s home, maybe there is a little history to discover and share. The desk is very simple in design. Constructed of quarter sawn oak it stands 3′ 10″ tall, 20″ across the front and 11″ wide. It is contains a shelf at the bottom, a single drawer with a lock and a writing desk carefully carved. The desk’s simplicity (not its photograph) catches the eye. Opening the writing desk leads to the first piece of curiosity. At first it looks like a very simple drawer pull used to open and close the writing surface, but as you move closer you can see that the pull is nailed onto the desk and once opened a lock is revealed. Perhaps the key was misplaced and the pull installed to allow easy access to the desk? The interior of the desk contains typical cubby holes for letters and envelopes and a drawer for other small items. 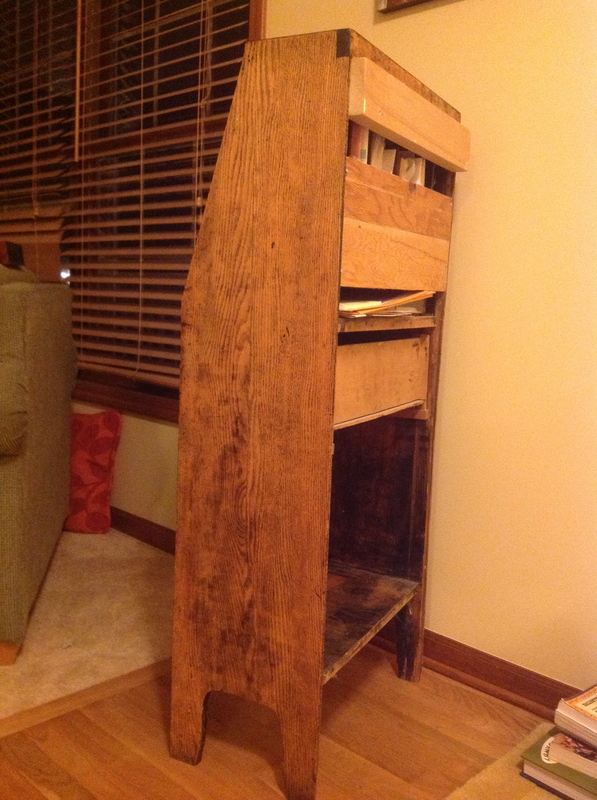 The entire structure containing the cubby holes and drawer is supported by a board nailed to the top of the chest. 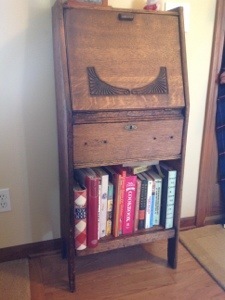 It hangs down as if by magic, leaving room underneath and to each side for bigger items. My wife wants to note that all items in the desk were staged for the photograph. I want to note that I didn’t know there was anything in the desk – I’m going back outside now…..